July 14, 2010 - The Red Bull Air Race in Budapest has been cancelled this year due to lengthy delays in the permissions process, the organization announced with regret on Tuesday. Interrupting a six-year tradition of racing in the Hungarian capital, the Red Bull Air Race World Champion will now be crowned after the final race of the 2010 season at EuroSpeedway in Lausitz, Germany on 7th & 8th August. Budapest has been an annual fixture on the Red Bull Air Race World Championship calendar since 2004 with enormous crowds of more than 600,000 spectators watching the racing from the banks of the Danube River. This year?s race, which would have been the seventh annual race in Budapest, was set for 19th & 20th August. Red Bull Air Race GmbH CEO Bernd Loidl expressed his disappointment over the Budapest cancellation, which comes just a week after a race cancellation in Portugal due to unexpected delays in reaching a revised host city agreement. But he said he hoped Budapest would be back on the calendar in 2011. Loidl also said the 2011 calendar will be announced after the final round in Germany next month ? which will include a return to New York after the historic first race there in June. ?Having safely and successfully executed the Red Bull Air Race World Championship in Budapest for the past six years, it was a tough decision to make,? Loidl said. ?Following so close to the cancellation of the Portugal race last week, we are obviously disappointed and every effort will be made to see a return to Budapest in 2011. ?Securing the future of the Red Bull Air Race World Championship is paramount and making tough decisions is part of that process. We look forward to announcing the 2011 calendar after the final round in Germany including a much anticipated return to New York in the United States.? The battle for the 2010 Red Bull Air Race World Championship will remain intense at Lausitzring in Germany, where defending champion Paul Bonhomme is holding a five-point lead over 2008 champion Hannes Arch of Austria. Arch has won three of the last five races and is confident he can overtake Bonhomme down the home stretch of the 2010 season to take his second title. 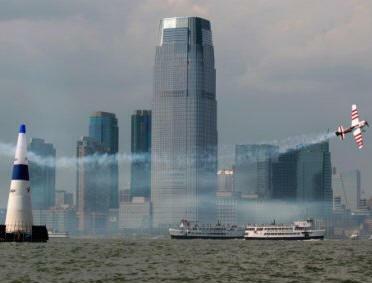 Red Bull Air Race has been a FAI-recognized world championship since 2005.